The story of French-Canadians and Métis people is often one of movement – of crossing borders, both literal and metaphorical. Many of the contributions to this collection underscore this with accounts of immigration, visiting family in another country, moving back and forth across the international border for generations, changing names, changing religions. In this contribution, Cheryl Granville Johns shares her story of crossing borders and the ensuing idyllic experiences of childhood, experiences which in turn fostered a connection to her heritage and extended family.—ed. Mouth of the Au Sable River, Ontario. Used under a Creative Commons license. I was born in 1946 in Detroit, Michigan to an American mother and a French Canadian Métis father. My mother’s family lived in Detroit and my father’s family resided about 100 miles away in the Port Franks, Ontario area where he was born in 1901. When I was five years old my father bought 26 acres of land in Arkona, Ontario on the Canadian Au Sable River near Rock Glen. 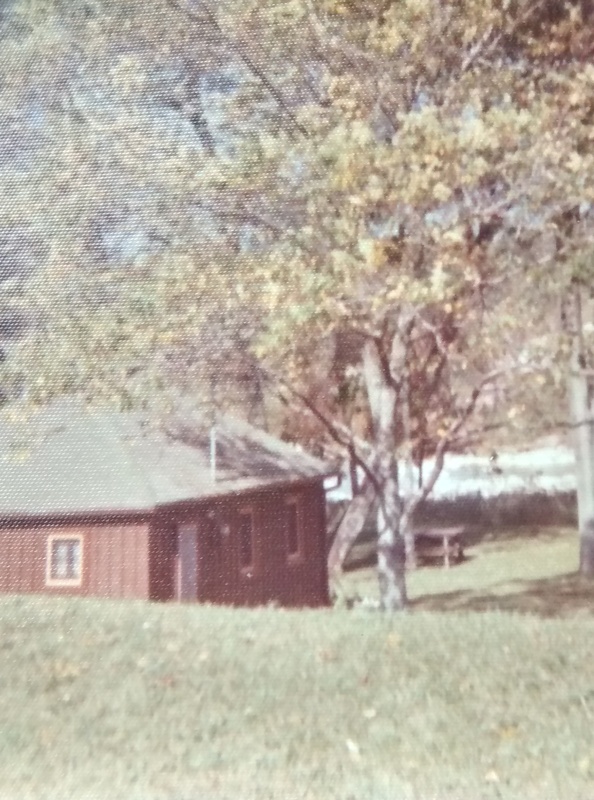 He built a little white cottage with green shutters there by himself, which is where I spent a great deal of summer time growing up. Our cottage sat below a bank next to a creek that ran into the Au Sable River, just feet in front of the building – some years in Springtime, the river flooded almost to the cottage door. I was in a whole new world there, but this was the world my father was most familiar with. We didn’t have running water at the cottage. There was a spring well 100 yards away that we had to climb a hill to get to, in order to fill metal buckets with drinking water. They were very heavy for a kid to carry back when filled with water, and the water usually sloshed so much as I walked that my shoes and socks were wet by the time I made it downhill to the cottage door. To make the toilet flush, we took a bucket, went a few feet away to the creek, filled the bucket with water and returned and poured the water in…. My father would drink from the creek water, insisting it was as pure as the spring water. There was one bedroom, for my parents. My sister and I slept on a sofa bed. For many years there was no electricity, just a kerosene lamp at night. Across the creek and up the bank was a grist mill that was 150 years old. I was ordered to never go into the mill alone because there were massive holes in the floor, revealing the creek below. A 15-foot water wheel that had once powered the mill lay along the side of the creek. A huge iron pipe along the creek had once brought water to the mill-wheel. I enjoyed walking it like a tightrope. A large grindstone rested near the mill door. The creek originated far, far uphill, nearly a mile away. Half a mile up the creek there was a wooden gate that looked like a dam that could be opened and closed to control the water flow to the mill. My father built a cement bridge over the creek between the cottage and the mill. Along the cement bridge sides, he wrote in big letters: Cheryl and Elaine Granville, 1953 – my sister and me. In Summer, we fished for dinner. Mother planted a huge garden each year and we all did a lot of gardening work. I remember being amazed when I was a small child to be told to pull what looked like a weed out of the ground, only to find a large orange carrot pop out. What delight!! In Fall, we watched the salmon jump from the river, fighting their way upstream against the rocks. But most of all, we played in the Summertime. We tracked raccoon prints at the river in the mornings, and rabbits and deer and gophers in the afternoon and picked wildflowers for the dinner table. We swam in the river and played with frogs, toads, crayfish and garter snakes. I remember with horror discovering a four-foot black snake by the water one day. We became too familiar with mosquitoes and horseflies, but found delight in fireflies. Many years later, when my husband and I were newly married, we were reroofing the cottage. About ten feet above the roof, a giant blue heron flew over us, the size of a small plane! We could not believe our eyes. I never saw an eagle there, but there were many varieties of birds and hawks. Uphill from the garden was a spot different from the grassy area around it. It was covered in ivy and was the gravesite of a 17-year-old girl whose family, named Marsh, had owned this property and the grist mill long ago. My sister and I eventually inherited this property as adults and owned it for many years until 26 acres became too much to care for by owners who lived too far away. We sold it around 1983 when our children were little. Two years ago, in 2013, my oldest daughter and I decided to take a ride on a magnificent Fall day, to visit my father’s gravesite in Forest, Ontario where he and his family are buried. We didn’t realize that it was Canadian Thanksgiving Day. While we were there, we decided to drive to my old cottage in Arkona, which my daughter had never seen and I had not seen in 30 years. We drove through the gate and saw the owner of the property. I told him I had once owned this property. He was sweet and gracious as we talked and walked around. He had purchased the property from his boss, whom we had sold the property to. The mill was gone, replaced by a nice small barn. The cottage was gone too. A beautiful 3000-square foot log home was next to where the cottage had been. The cottage cement foundation had been repurposed as an outdoor patio. Eventually the owner told me his name and I told him mine. A smile came across his face. “You are the name on the bridge,” he said. “Yes,” I said. This property allowed me to know and love the outdoors, love Canada and the earth, and allowed me to know and love my French Canadian relatives who are very special people. Building the cottage was the greatest gift my father ever gave us. Front Page Feature Image: Saugeen Métis Monument to which the author of this piece is connected. My Grandmother , Myrtle Susanna Marsh was born here in 1905! She would have had similar memories as you and your sister, so your description is sweet and emotional for me!! She probably would not have been allowed to walk along the pipe as it would have been in operation!! And helping her mother care for her father, 5 brothers, and a baby sister would have kept her very busy!!! I am curious as to who the 17 year old Marsh girl buried on the hill was? My Great Grandparents, Thomas and Sarah Marsh, were fortunate to have all 7 of there children live long lives… Maybe my new research project!! I was there once in the early 1980’s and am wondering if I saw your cottage?! My parents have visited for Family reunions since then. My grandmother married and immigrated to Bucks County Pennsylvania in the 1930’s to a Dairy Farm where my father and I grew up and have very similar fond memories of child hood!!! If you are not familiar with the Book, “Busy in the Mill ~ Diary of George Marsh of Hungry Hollow” by Carol Field McKee, I highly recommend it!! !